For the past few years Neal White has been engaged in an ongoing project as Artist in Residence at the Centre for Land Use Interpretation, Utah, USA. White explores notions of experiment through a range of practices, from site-specific installations to performative documentation. His work examines how archives operate and raises critical questions as to what it means to preserve artworks, physical spaces, and documentation, specifically in relation to an artist’s own intentions, and in relation to concepts of time. White has focused on specific artist's archives as collections, as physical spaces, and as a conceptual territory to be traversed, some of his themes and concepts have been developed around the ideas of the American, Robert Smithson, and the conceptual work of the British artist John Latham. Neal White’s residency began in 2007 when, with the permission of the Centre for Land Use Interpretation and the artist Nancy Holt, he made a short film at the Remote Location, the site which Robert Smithson and Nancy Holt first acquired for the placement of Spiral Jetty, Smithson’s remarkable 1,500 foot long land work that spirals into Utah’s Great Salt Lake. Cycling to the shape and size of Smithson’s great work, White recreated Spiral Jetty as a performance, leaving a temporary trace in the desert. The film of this event was subsequently exhibited at Queens Nails Projects, San Francisco in 2009. Following from this, and building on footage filmed through the spectacles of the artist John Latham at Spiral Jetty in 2007, White recently returned to Remote Location and to other related sites to question the way in which Spiral Jetty is represented and understood, and to explore the complex issues that emerge around its preservation, as discussed in the art press and other coverage. Ironically, the preservation of Spiral Jetty is under a new threat as government and agencies consider taking over the site in their endeavour to save the planet from global warming and food shortages. At Chelsea Space Neal White presents amongst other works, a piece entitled Entropic Popsicle. The 'popsicle' referred to is not a food snack, but is imagined as a tool to explain to passers by the concept of entropy and Latham’s concepts of time. 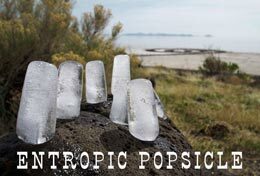 This popsicle will be shown in an artists’ film shot partly at Spiral Jetty, and intermixed with other site related footage. White also created a temporary popsicle stand at the Salt Lakes which will be shown as an artefact alongside the short film. Transferred from the infinite landscape (Smithson’s ‘Museum of the Void’) to a contemporary exhibiting space opposite Tate Britain, White’s work deals with concepts of time and events and the interpretation of a remote space. Neal White intends also to raise awareness of the issues that face this environmentally sensitive site and offer support for the preservation of Spiral Jetty. Neal White is an Associate Professor in Art and Media Practice at The Media School, Bournemouth University and Visiting Research Fellow at Chelsea College of Art and Design. This project has been undertaken under the auspices of the Office of Experiments in the UK and the Centre For Land Interpretation in the USA with Financial Support from The Henry Moore Foundation.